In 2011, New England Patriots tight end Rob Gronkowski posted the greatest season ever, for a man at his all important position. The Arizona-alum caught 17 touchdown passes, while totaling 1,327 yards (both NFL records for TE). Gronkowski became the first TE to lead the league in TD receptions. Entering year three of his career, the 6-6, 265 lbs. beast now stands as one of the most prominent players in all of football. He has found himself on the cover of numerous publications, while also becoming one of the main topics of conversation at fantasy football drafts throughout the United States. The dynamic tight end duo of Gronkowski and teammate Aaron Hernandez combined for 169 receptions and 24 touchdowns in 2011, becoming the most productive and revolutionary tight end combination in NFL history. At only 23-years-old, the future could not be brighter for Gronkowski, despite a couple of off the field bumps in the road, including a circulated photo with an adult film star and a separate incident of him dancing without a shirt, hours after the Pats heartbreaking loss the New York Giants in last February's Super Bowl. The Patriots rewarded Gronkowski's level of production, while looking past his away from the game judgment, by signing him to a six-year/$54 million contract extension, making him the highest paid TE in NFL history, during this offseason. 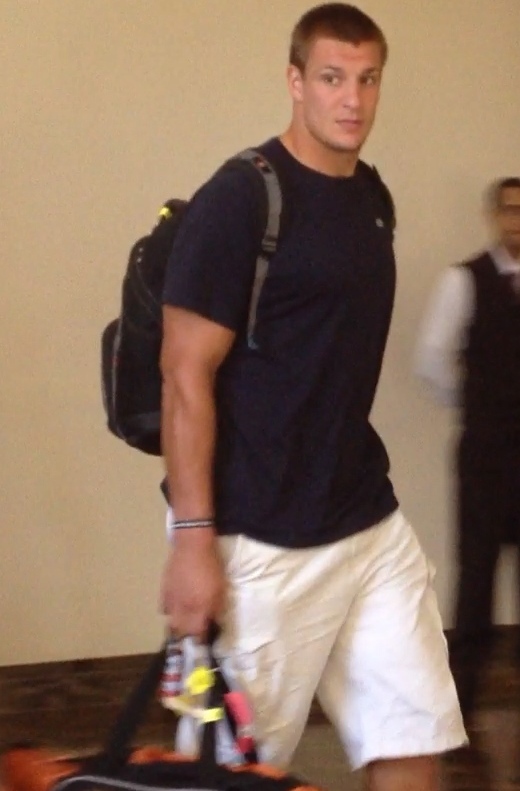 Above is an iFolloSports.com original photo of Gronkowski, at the Sheraton Meadowlands Hotel & Conference Center in East Rutherford, New Jersey, prior to a preseason game versus the Giants on Wednesday. These days, the man they call “Gronk” has no problem garnering attention, no matter what circumstance he finds himself in.